Time to hitch up the wagon and keep heading west! It sure is a long trip from the mighty Mississippi River to the majestic Pacific coastline, but luckily there is plenty of beautiful countryside to see while rolling down the trail. And while there might be some fur trappers or Native Americans to trade with along the way, it could also be a pretty quiet journey, and your group could be on your own for much of it. At least it will look like your little lady is up to the challenge when she's wearing this White Pioneer Bonnet with her frontier period costume! 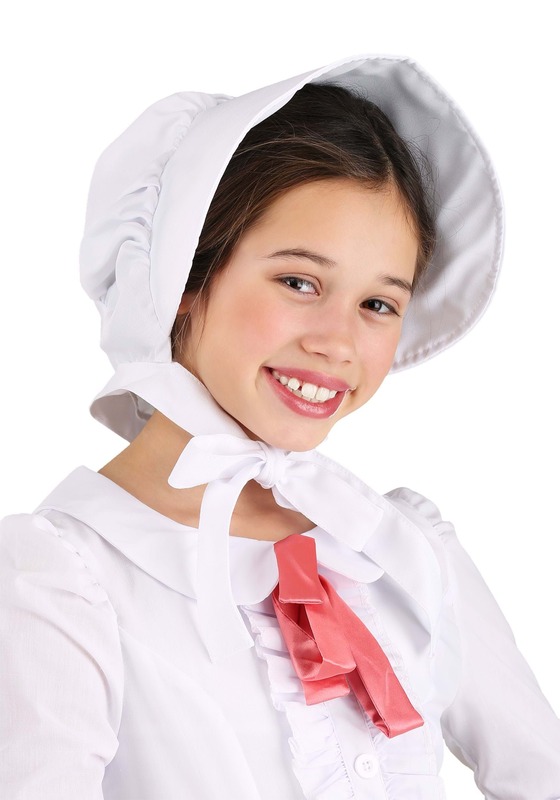 This synthetic cloth head wear looks just like the types of vintage bonnets girls wore during the days of the Oregon Trail, with a wide brim and ties under the chin. It makes the perfect accessory for a pioneer reenactment or play. Now, if she can also fix a wagon axle, she'll be really ready!